Meet the royalty among the Cognacs Ever met a royalty? Burger King doesn't count. Let us introduce you to the monarch of spirits. Meet 1738 Accord Royal, an exquisite and unique Cognac blend from the Cognac monarch Rémy Martin, from the very heartland of Cognacs - yes, you guessed it, the city of Cognac. This lavish liquor is everything extraordinary about France in a bottle. 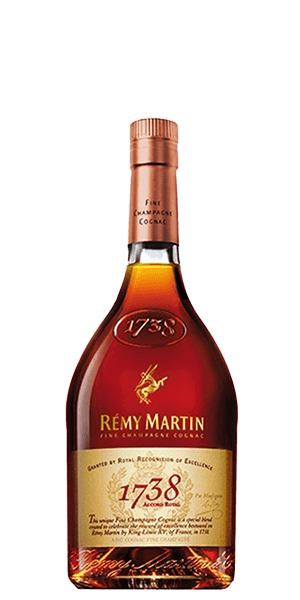 It got its name from the special year of 1738, when King Louis XV granted the Accord Royal to Rémy Martin, which allowed him to plant vines on his land (which was banned in France until then). This bottle is a blend of Grande Champagne and Petite Champagne grape (in 65:35 ratio) and has been known for its big-brute flavor and a mellow finish since it first came out in 1997. 1738 Accord Royal sits comfortably between VSOP and XO, which makes it a Napoléon Cognac: aged for at least six years in oak barrels, but in average, such Cognacs are 20 years old. When this deep amber delicacy is poured into a glass, it demands to be tasted, and it can be enjoyed in so many ways: sip it straight, drink it as a digestif, take it on the rocks, or make a mean cocktail out of it. We recommend Emperor's Call! If you're a fan of the cult VSOP, you will definitely love this royal upgrade of vanilla and vinous notes with some additional regal gusto that brought this Cognac a silver medal in 2014. What does Rémy Martin 1738 Accord Royal Cognac taste like? The Flavor Spiral™ shows the most common flavors that you'll taste in Rémy Martin 1738 Accord Royal Cognac and gives you a chance to have a taste of it before actually tasting it. Notes of vanilla and ripe fruit with a hint of herbal vinous aroma. Balanced vanilla and dried fruits. The cheapest good tasting cognac available. Very very nice when warm and neat. Warming sweet baking spices w/ grape in the background. Nice light sweet finish w/ oak at the end. Better than Hennessy Privilege in my opinion. Always a great cognac. It has been my favorite for years. And it will continue to be so every fall/winter to come - fireplace, good music and a snifter of 1738. Yep - bring on the cold. Don't like the nose burn taste and the paint thinner. Loved it! Very smooth taste. No after burn. This was my first Cognac. If the rest are similar, they will be come some of my favorites. This tastes much like a bourbon with subtle fruit flavors. Nice and smooth with a whiskey like bite on the finish.